A three-level commercial building overlooking Addington Raceway in Christchurch has been constructed using PRESSS technology and post-tensioned concrete shear walls, and includes replaceable energy dissipators and self-centring mechanisms. In this project BBR Contech began by supplying Macalloy 50mm-diameter starter bars, which were cast into the building’s foundations. 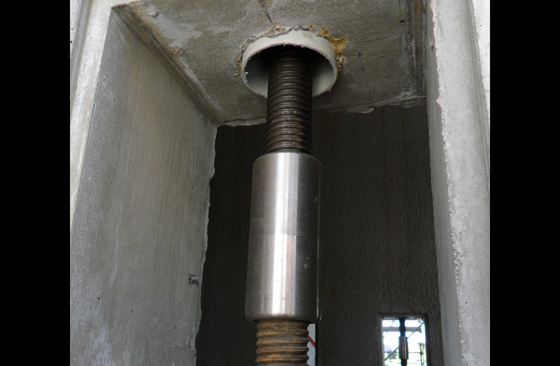 Then, once the precast walls had been installed, we coupled to the starter bards and tensioned 16 full-height Macalloy 50mm bar tendons. The tendons were tensioned from the top and left unbonded; this means that, should another significant earthquake strike, the load can be easily and quickly tested and, if necessary, adjusted. Architecturally designed to meet 100% of the new construction standards, the building has the ability to resist a one-in-2,500-year seismic event with no additional structural expense.